It is a cold, rainy day in Chunchi, a canton in the Chimborazo Province in southern Ecuador. Eight-year-old Nicole has just arrived at school in Ramos Lomas, one of the rural communities in Chunchi. 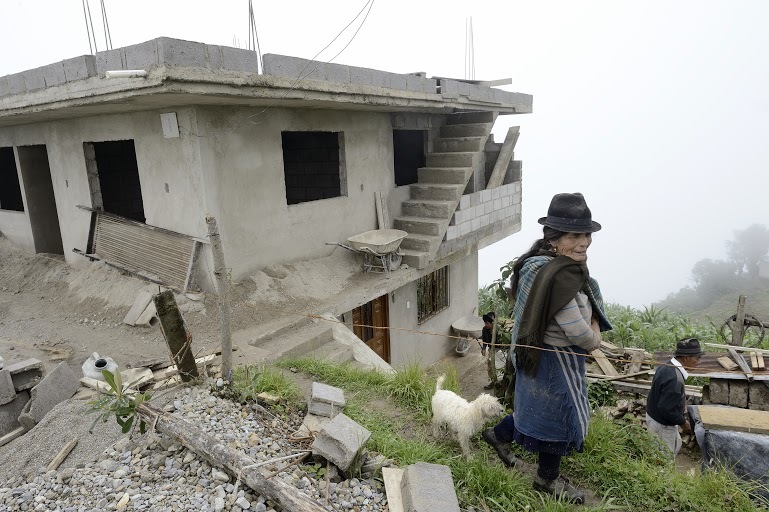 When asked where she lives, she points to a nearby simple stone house that is only half-finished. “With my grandparents and my uncles, over there,” she says. Nicole’s grandmother, Maria Guaquilema, a woman with a heavily wrinkled face, looks older than her 68 years. She proudly shows off her new home, inviting us to come in despite the fact that it is still under construction. She says that they have built it little by little, using remittances sent by Jennifer—Maria’s daughter and Nicole’s mother—who lives in New Jersey. Jennifer left for the United States two years ago, leaving behind her young daughter and 6-year-old son, Eric. “She sends us around $200 a month. She cleans houses, she can’t do anything more. She is always worried about us. Things aren’t going very well here. We don’t have any way to cultivate the land or feed our cows,” Maria says in Spanish, though her native language is Quechua. She adds that Jennifer also calls her children every other day. Nicole and her brother Eric represent the current phenomenon of young children raised by their grandparents or other relatives—mostly women—and supported by remittances from parents who have emigrated abroad in search of work and a better life. The lack of daily contact with their parents makes them more susceptible to the pitfalls of adolescence, including teen pregnancy, drug abuse, and even suicide. Nicole, who is in the fifth grade, attends the Unidad Educativa Maria Auxiliadora Fe y Alegria. When the teacher asks the students who have parents living abroad, they are reluctant to reply. The pupils look at each other, smile shyly, and pretend to write. But when they think that no one is looking, they tentatively raise their hands. Of the 28 students, only 5 live with their parents; the rest are being raised by their grandmothers or grandparents. Among them is Nicole A., a girl with immense dark eyes, thick eyelashes, and a ponytail that falls just above her shoulders. Her ears are healing from an infection after she tried to pierce them herself and didn’t clean them properly with rubbing alcohol. Despite the infection, she insists on wearing a pair of earrings that her mother sent to her from the United States. She says that she dreams of being a fashion designer when she grows up. In Chunchi, parents typically walk their children to school and then stay to speak with the teacher about their children’s academic performance. “It’s a daily activity, they come, they talk to us. But with other children it’s different; they don’t have any parents. When I had just started at the school, I held a parents’ meeting and was surprised to see only women and elderly people there,” says Cabezas. In response, the Chunchi municipal government has implemented the Free Time program for children over the age of seven. Initially intended for the children of emigrants, it provides assistance with homework, as well as classes in subjects including art. Vanesa, who is 15 years old, is with four of her friends in a park located close to the route that connects the parishes of Chunchi. She still hasn’t done her homework, and her friends haven’t either. Two of them are wearing their school clothes, with backpacks hanging from their shoulders. Vanesa is dressed more casually; she wears tight jeans, large silver rings, and a short sweater that shows off her midsection. Vanesa’s father and uncles live abroad. “I used to live with my aunt Rosa, but then she left for Newark too. Now I live with my mom who has been back for two years, but I can’t put up with her,” she says. She is finding it hard to adjust to having her mother back home. “It’s difficult, they don’t understand me,” she says of her parents. Rosa, who is 14 years old and has large green eyes, says that she lives with her aunt. Her parents emigrated when she was two years old. The last time that she saw her mother was five years ago, when she promised to take Rosa to live with her. “Sometimes he says he’s thinking about doing it again,” Vanesa says. She adds that Luisito doesn’t want to answer any more questions from the press. He regrets having given an interview once, because the entire town now knows his story. Emptiness. Loneliness. Sadness. These are the words commonly used by children and teenagers who have attended counseling sessions with one of the two psychologists currently practicing in Chunchi. Wagner Suarez, who is from the town of Guayaquil, 87 miles away, spends five days each week in the canton. He has been the head of the psychological unit since 2007, two years after the first reported cases of attempted suicide. One case involved an 18-year-old named Miguel who was about to leave for the United States when he learned that his mother had become pregnant by a man other than Miguel’s father. “Imagine what this kid felt, the look on his face when he would tell his dad the truth,” says Wagner. He looks away for a moment, and then says that there is no more time to speak. Finally, he reveals how the story ended: Miguel hung himself from a tree.